Faced with inevitable decline in our access to hydrocarbon resources, we read of numerous ways in which we will have to downsize, use less, work less, grow our own food, use goods and services close to home, consume only what we can manufacture within our own personal environment, or within walking distance. If we are to survive, we must ‘live local’ because the means to exist in any other context is likely to become very difficult. There is rarely, if ever, any mention of the healthcare we currently enjoy, which has given us a reasonably fit and healthy 80 year average lifespan. There seems to be a strange expectation that we will remain as healthy as we are now, or become even healthier still through a less stressful lifestyle of bucolic bliss, tending our vegetable gardens and chicken coops, irrespective of any other problems we face. And while ‘downsizing’ – a somewhat bizarre concept in itself – might affect every other aspect of our lives, it will not apply to doctors, medical staff, hospitals and the vast power-hungry pharmaceutical factories and supply chains that give them round the clock backup. Nor does downsizing appear to apply to the other emergency services we can call on if our home is on fire or those of criminal intent wish to relieve us of what is rightfully ours. Alternative lifestylers seem to have blanked out the detail that fire engines, ambulances and police cars need fuel, and the people who man them need to get paid, fed and moved around quickly. In other words ‘we’ can reduce our imprint on the environment, as long as those who support our way of life do not. Humanity, at least our ‘western’ developed segment of it, is enjoying a phase of good health and longevity that is an anomaly in historical terms. There is a refusal to recognize that our health and wellbeing will only last as long as we have cheap hydrocarbon energy available to support it. This is a multimedia presentation by Professor Hank Weiss, delivered Tuesday, October 02, 2012 at the Safety 2012 World Conference (47 min). Adolescents warrant special attention. From a road safety perspective, they carry the largest crash and morbidity/mortality risk of any age group. This has led to considerable research and safety programs, but these efforts have plateaued in many countries and remain fixed within a road safety perspective. From a broader perspective, little has been done about the many non-traffic health risks related to teen driving (increased drug and alcohol use, anti-social behaviour, sexually transmitted infections, inactivity and obesity). From a sustainable transport perspective, a contemporary imperative, teens are where the transition from non-driver to driver takes place; an opportune time for interventions to minimize environmental harms. 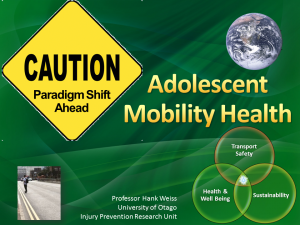 Professor Weiss introduces a new paradigm termed ‘mobility health’ to bridge the siloed domains of safety, adolescent health and sustainable mobility. In this passionate speech to an international audience, he advocates changing the current narrow paradigm of adolescent road safety to a cross-level/cross-disciplinary, more potent, timely and healthy vision of less driving through mobility modal shift from cars to active and public transport. The Alliance for Natural Health has defined sustainable healthcare in the following way. A complex system of interacting approaches to the restoration, management and optimization of human health that have an ecological base, that are environmentally, economically and socially viable indefinitely, that work harmoniously both with the human body and the non‐human environment, and which do not result in unfair or disproportionate impacts on any significant contributory element of the healthcare system. Based on this definition, there is very little about our existing healthcare system that is sustainable. To achieve sustainability, it is necessary to look beyond what we have now to what we really want. Health after Oil will occasionally offer reports from practitioners who are aware they are working in health systems that are unsustainable and in need of transformation. We begin this series with two practitioner accounts of reactions to the implementation of President Obama’s recently Supreme Court upheld health legislation. The first is by Dr. S., a psychotherapist in a rural setting. She discusses the possible implications of the Affordable Care Act (ACA). The second post is by Michael Bennett, a nurse, commenting on how the ACA has overlooked the issue of ecological sustainability. Dan Bednarz, Ed. As a solo mental health practitioner in a remote rural California community, I’d like to share my experience with what is happening along the way to the collapse of our health care system. I opened my private psychotherapy practice in this rugged and remote area of California in 2006 because it was a community where there were no locally based full-time practitioners. Residents who needed mental health care were either foregoing treatment or driving an hour each way for their 50-minute hour of talk therapy or their 10-minute “med check” with a psychiatrist. I reasoned if I established mental health services here in this rural community when the health system/economy was still running, then as the collapse unfolded I would be able -in this localized setting- to offer my services in whatever alternative socioeconomic system of exchange emerges. While there is still no local psychiatrist here, over these past six years I have been able to establish a successful private practice. This has been made possible by 1) advertising in the local community newspaper, 2) working hard to get into as many insurance networks as possible so that people with insurance can see me and 3) offering a sliding fee scale for clients without insurance. While I have always favored shifting health care to a single-payer system, I did not oppose President Obama’s Affordable Care Act (ACA). As this “reform” is beginning to take shape in California, however, I am seeing that it will most likely put me out of business and thus leave our rural community once again without access to local mental health services. This is not only an economic concern to me but personally and professionally frustrating because the localization of health services will be critical in the net available energy descending society we are now entering. Today I want only to discuss why the ACA is working against my efforts to build a localized practice. A Requiem on Rio+20 – So now what do we do to defend life on Earth? It is, perhaps, the greatest failure of collective leadership since the first world war. The Earth’s living systems are collapsing, and the leaders of some of the most powerful nations – the US, the UK, Germany, Russia – could not even be bothered to turn up and discuss it. Those who did attend the Earth summit last week solemnly agreed to keep stoking the destructive fires: sixteen times in their text they pledged to pursue “sustained growth”, the primary cause of the biosphere’s losses. The modern end-of-the-world imagination often seeks out great Hollywood-style cataclysms: an asteroid collision, all-out nuclear war, a solar flare that wipes out the electrical grid, even a worldwide epidemic that leaves few alive. Less compelling is the possibility of relentlessly rising death rates that finally overwhelm birth rates and quietly set worldwide population on a downward path. While such a development would (gruesomely) address population pressures over time, it would be both highly disruptive–the costs of coping would be very high compared to family planning–and also morally repugnant if allowed to occur through intentional neglect. The idea that a decline could unfold in this manner, however, is so far from any policymaker’s mind that it doesn’t even seem to register. And, yet the seeds for it are being sown right now. As the world economy continues to sputter, government revenues fall. More and more nations are embracing fiscal austerity and public health budgets are being cut. The situation has become exceedingly dire for Greek citizens whose health care system is being slashed to meet austerity targets demanded by Eurozone lenders as the price for keeping the government financially afloat. Because many pharmacies have not received government payments for drugs they dispense in such a long time, these pharmacies are now demanding cash up front. And, impoverished Greeks are finding it difficult and often impossible to pay.